One of the most famous Westerners in Southeast Asia was James (Jim) H.W. Thompson. Born 1906 in the USA, he disappeared traceless on easter Sunday 1967 on a stroll in the Cameron Highlands, Malaysia. The adventurous, versatile man became the recommendation of the so called 'silk king' of Thailand. Jim Thompson, 1906 - ? Thompson studied at Princeton University and the University of Pennsylvania. Later he worked as an architect in New York. 1941 he volunteered for the US Army and became employed at the OSS, the forerunner of the CIA. At the end of the Second World War, Thompson was sent to Ceylon (Sri Lanka), to support and cooperate from there with the Seri Thai Movement, a Thai resistance group which fought the Japanese in Thailand. After the war he was stationed in Bangkok, where he served as a station chief until 1946. In this time, Thompson became a military attache for the United States and travelled in the border regions of Thailand and Laos, using his contacts to the former Seri Thai and Free Laos guerilla groups to moderate border issues. Cooperating with him was an American, who's wife, Margaret Landon, was the author of 'Anna and the King of Siam', on which the famous musical 'The King and I' (Rodgers and Hammerstein, 1951) is based. For the stage costumes was then Thai Silk used, which made Thompson's business so succesfull from the 1950s on. After a failed takeover of the old Oriental Hotel, he run accidentally into the idea of promoting Thai Silk. 1948, Thompson co-founded Thai Silk Company Ltd. Silk was at that time of no commercial importance, but only handmade in local scale for local markets. Thompson's idea was to improve quality and productivity by introducing a combined traditional and industrial silk production. 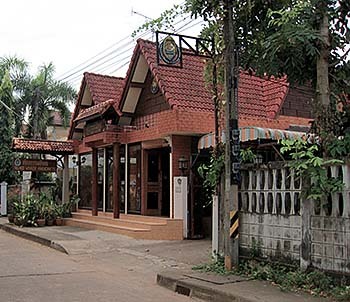 He used a network of muslim weavers, of who he settled down a community opposite his home in Bangkok, what is now the museum Jim Thompson House. The vast majority of his workers, one has to add that, were women. The designs he developed were based on such he found on his extensive collection of pieces of Southeast Asian art, which he brought home from his journeys through Thailand, Laos, Burma and Cambodia. 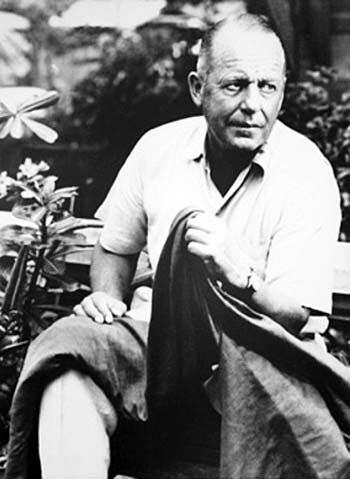 Jim Thompson was a talented salesmen, selling people his stuff although they often didn't have any interest in it. Within a few years he made many international hotels and individuals from the high society his customers. Over easter 1967, Thompson went with friends to a cottage in the Cameron Highlands. On easter sunday, after a picknic, when his friends had an afternoon nap in the cottage, Thompson went on a stroll. He was never seen again then, and three extensive search expeditions didn't find the slightest trace of him. At that time Thompson was 61 years old, healthy and physically in a good shape. In the war years he got military trainings, among them survival in the jungle. Since there is no hint about his whereabout, guesses are many. He would have been killed and eaten up by a tiger, hit by a truck and afterwards taken away by the frightened driver, lost deeply in the tropical rainforest of the Cameron Highlands, hijacked and killed by business competitors, committed suicide or even that he disappeared organized with help of friends and living another live in another place for more years. Who knows? The disappearance of Jim Thompson is mentioned in Eric Amblers thriller 'Send No More Roses' (1977). The speculation described there is that Thompson fell on his stroll in a tiger trap and got killed by the pointed bamboo poles rammed into the ground. The Malays then were scared that an American was killed by their trap and burried the corpse deep anywhere in the jungle.